Vintage Scottish Celtic MIRACLE Silver Tone Brooch Kilt Pin 2.75"
Could easily pass for a Scottish - Celtic - Welsh Dragon. Simply strong fastening pin to the rear. Large in size for maximum impact = 50MM in length. The fastener is a slightly brighter shade of gold than the rest of the bracelet so could have been replaced. With secure fastener and in otherwise very good condition. I'm really easy to get along with and try my best to make this a pleasant experience for all involved! make Supersized seem small. Get images that. A lovely lavalier necklace set with a drop pendant set with glossy green agate glass and round marbled agate glass cabochons. Suspended from another marbled agate glass cabochon and two further green glass shapes. Signed to reverse MIZPAH with the two hearts and arrow logo - there also appears to another stamp mark to the left of this - could be a L or a T. This is a superb very large Scottish kilt brooch - nearly covers the whole width of the hand. SORRY BOX NOT INCLUDED FOR DISPLAY ONLY. 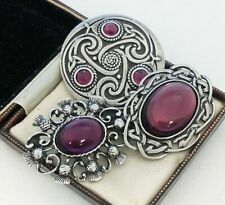 A great mixed lot of Scottish vintgage jewellery. To include 9 brooches (4 signed Miracle), 2 pendants and 1 bracelet. All with secure fasteners and in very good condition. Attached to a pewter tone chain and complete with c / bolt clasp. Would make a unique gift, signed to the back of the drop "Miracle". Signed Miracle to the rear of pendant. Normally a 70s set but the necklace has a 90s fastener so could have been replaced. With carnerlian/lemon glass stones. All have secure fasteners and are in very good condition. Gold tone with Scottie dog in the window. In excellent condition. PERIOD/STYLE: SCOTTISH CELTIC. MAKE:UNSIGNED BUT I BELIEVE THIS TO BE BY MIRACLE. A BEAUTIFUL ITEM THAT WOULD LOOK STUNNING ON ANY OCCASION, TO ADD TO A COLLECTION OR GIVE TO THAT SPECIAL PERSON AS A GIFT. A BEAUTIFUL CELTIC CROSS WITH A POLISHED ORANGE TONE AGATE GLASS SAFELY SET AT THE CENTRE. ROLO LINK NECKLACE. APPROX 30cm INCLUDING THE PENDANT. SPRING RING CLASP. A BEAUTIFUL BROOCH TO ADD TO ANY COLLECTION & TO WEAR. CONDITION: IN CLEAN CONDITION, ALL STONES INTACT AND SAFELY SET, PIN AND CLASP IN WORKING ORDER. FASTENS WITH A ROLL-OVER CLASP. Set with a grey,black and white swirl rectangular agate - such a lovely pattern. AGATE BROOCH. A gorgeous brooch dating to the Victorian era. Secured with a period C Clasp and over extended pin with a tube hinge. Vintage Silver Enamel & Marcasite Thistle Flower Brooch Scottish Pink and Yellow. Dispatched with Royal Mail Signed For® 1st Class Letter. OLD VINTAGE CELTIC SCOTTISH TESTED SILVER BROOCH ARTS & CRAFTS?? THERE ARE NO MARKINGS AS FAR AS I CAN SEE. THERE IS DEFINITE AGE TO THIS BROOCH I BELIEVE IT'S FROM THE ART DECO PERIOD AND HAS A LOVELY SOLID FEEL TO IT. Vintage Scottish Bydand Clan Gordon Crest Silver Tone Pin Brooch. Shipped with USPS First Class Package. The earrings have possibly had Miracle on the edges but now faded but on a Miracle card. All have secure fasteners and are in very good condition. Unmarked, but possibly made by Miracle or Jacobite - silver plated with real carnelian agate stones. Vintage Scottish Sterling Silver Celtic Iona Circular Brooch. Dispatched with Hermes. The hallmark on this looks like s & co, then a thistle, then a castle then a fancy g. Edinburgh pre 1975? No 925 or silver present but it is. C clasp and a bit dirty. Diameter just over 1.5 inches.. Really nice and I will put it in a box.. I believe this one would have been made to stand in a Marble Base as its large and heavy. PERIOD/STYLE: SCOTTISH CELTIC. MAKE: MIRACLE. A BEAUTIFUL ITEM THAT WOULD LOOK STUNNING ON ANY OCCASION, TO ADD TO A COLLECTION OR GIVE TO THAT SPECIAL PERSON AS A GIFT. DISPLAY BOX: NOT INCLUDED. It has a aged look to it. The pendant is 3/4" round, the brooch is 2" across and 1" wide. The back is signed. ST JUSTIN PEWTER JEWELLERY IS INSPIRED BY OLD CELTIC MANUSCRIPTS AND ARTWORK. C ROLL CLASP. This is a beautiful large 2 1/2" Miracle brooch. The topaz colored stone is faceted and is 1 1/4" round. The brooch is in excellent like new condition. It is very rare.